GEOGRAPHERS ARE CONCERNED with studying elements of the natural and human environments. They want to determine the relationships between these elements and wish to explain their patterns of location. Vegetation is an important and highly visible element of the natural and cultural environment. To the trained eye, vegetation offers a rapid means of determining habitat suitability for various human endeavors. One way that geographers study vegetation is to investigate environmental relationships. Vegetation has significant relationships with climate and water, soils, landforms, other plants, animals, and humans. Vegetation has such a close relationship with climate that geographers often proclaim that vegetation is the mirror of climate. Comparing a world vegetation map with a world climate map in any good atlas clearly shows that specific categories of vegetation are associated with certain types of climate. To illustrate, we always find desert vegetation in areas with arid climate, savanna vegetation is usually associated with tropical wet and dry climate, steppe vegetation is most often located in areas with semiarid climate, and the northern coniferous forest is part of subarctic climate regions. Vegetation responds to temperature and moisture conditions. As a rule, the higher the temperature, the faster the rate of plant growth. Tropical rainforest trees may grow to maturity in as little as 25 years, while those in the northern coniferous forest may need 75 years or more. Plant metabolism slows greatly and significant tree growth stops when temperatures drop below 50 degrees F (10 degrees C). Many tropical plants cannot survive temperatures below freezing. Most plants depend upon seasonal rainfall, although some can draw upon groundwater supplies. In mid-latitude regions, trees require a minimum of about 20 in (50 cm) of rainfall per year. Some tree species require wetlands while others are adapted to life in drier terrain. The cypress tree, for example, is hygrophytic (water-loving) and grows in swampy parts of the southeastern United States. Oak, maple, and ash trees, however, prefer drier conditions. Plants grow in soil. Soils must contain the nutrients and moisture conditions that plants need in order to survive. Unlike cultivated plants, which are “soil robbers” that demand many nutrients from the soil, natural vegetation is less demanding. Nevertheless, soil conditions affect vegetation patterns. Here is an example: we would not normally expect to find large numbers of coniferous trees in the mid-latitude mixed forest of the southeastern UNITED STATES. However, this part of the country contains regions with poor quality sandy soils; coniferous trees predominate in these regions because they tolerate such soil conditions better than broadleaf deciduous trees. Plants in turn affect soils. Some plants, such as clover, have nodules on their roots containing bacteria that manufacture nitrates, an essential soil nutrient. After death, plants contribute organic matter to the soil. Midlatitude grasses contribute the most organic matter, while trees supply moderate quantities. Temperatures affect the rate at which organic matter decays; moderate temperatures maximize the soil’s humus, which is partially decayed organic matter. The best soils are rich in humus. The best soils are also found where rainfall levels are not so high that they wash nutrients and minerals out of the soil. Landforms affect plant life in several ways. The higher the altitude, the lower the temperature; therefore, the types of plants one encounters near the top of a mountain differ from those at the base. Mountain ranges influence precipitation distribution patterns; lush vegetation is often the rule on the rainy windward side of mountains, while the lee side, in the rain shadow of the mountains, is more arid and home to plants that exhibit dryland characteristics. Animals have an interrelationship with plants, too. Who hasn’t heard about the beneficial effects of earthworms? Birds eat and spread seeds; so do fruit-eating animals. Herbivorous animals eat plants; overgrazing can have hurt plant life. Humans, of course, cultivate plants that they have domesticated. They modify the natural environment and plow the soil to do this, killing or removing weeds that compete with their crops. Although people believe that trees contribute beauty to the natural landscape, they also consider trees to be either obstacles or resources. Farmers in colonial New England removed trees to provide more land for crop cultivation. Other colonists cut down trees to build houses and ships and to make containers for carrying cargo. Native Americans, on the other hand, looked at the forest as habitat for the animals they wanted to hunt. The ways that different groups of people view trees and other kinds of vegetation depends on their cultural perspective. Another approach that geographers take to the study of vegetation is to classify plant types in order to understand complicated patterns. For example, most plants are either broadleaf or needle-leaf. Broadleaf plants, in turn, are either deciduous or evergreen. Deciduous broadleaf plants are found mostly in the mid-latitudes, where cold temperatures during the winter cause plants to shed their leaves and enter a period of dormancy. Examples of this category of plants include hardwoods such as maple and oak trees. Broadleaf trees found in the tropics are mostly evergreen, except when plants shed their leaves in response to seasonal drought. Examples of these include mahogany and greenheart trees. Needleleaf trees are also known as coniferous trees because most of them produce cones as a way to reproduce. Needle-leaf trees are predominantly evergreen. The tamarack is an exception, since it sheds its needles during winter. Pine, cedar, spruce and fir are all examples of evergreen needleleaf trees. Mostly softwoods, they are found in a wide range of latitudes where they tolerate poor soils and cold temperatures well. Another way that geographers classify vegetation is to look at biomes or plant associations. 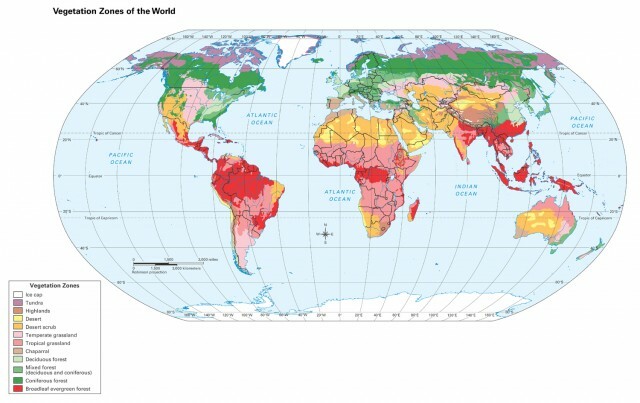 We have identified four major biomes: forests, tropical grasslands, mid-latitude grasslands, and deserts. Rather than focus upon individual plant types in these biomes, as botanists do, geographers find it more useful to study plant associations, that is, the combination of plants found in any place. Forests are plant associations that are dominated by trees. Forests are found wherever average annual temperatures exceed 50 degrees F (10 degrees C) and annual rainfall is higher than 18 or 20 in (46 or 50 cm). Trees cover approximately one-quarter of the Earth’s land surface. One thousand years ago, about half of the Earth’s land surface was tree-covered. This means that we have cut down about half of the earth’s forests during the past ten centuries. The mid-latitude mixed forest is one type. It covers much of eastern North America and western Europe, among other places. It takes its name from the mixture of broadleaf deciduous and evergreen needle-leaf trees found within it. Humans cut down these trees for lumber and to clear space for farming and cities. The northern coniferous or boreal forest is found only in the Northern Hemisphere. The largest area of this type of forest stretches across Eurasia from Scandinavia in the west to the northeastern corner of RUSSIA. For that reason, we often use the Russian word TAIGA to identify it. The coniferous forest that extends from ALASKA eastward across CANADA is almost as large. The trees in this type of forest are mostly needle-leaf, but islands or enclaves of broadleaf trees such as birch, poplar and aspen can be found within the sea of coniferous trees, most of which are softwoods. Industries use the coniferous trees for lumber or may grind them up to create wood pulp for papermaking. Because of their high pitch content, they burn easily, and forest fires are a problem in this part of the world. Average temperatures in Canada and Russia are low, so trees grow slowly. It may take as long as long as 75 years for trees there to grow to maturity, so conservation (wise use) of this resource is important. Unlike the taiga, tropical RAINFOREST trees are primarily dense hardwoods. They have buttress roots and rise straight up branching out 100 feet or so above the ground to form a leafy canopy. Here is where many arboreal (tree-dwelling) animals live, far above the forest floor. Parasitic plants such as lianas (vines) attach themselves to the trees, sucking nourishment from the host plants. Epiphytic (air breathing) plants also attach themselves to tree trunks and branches. Epiphytes take their nourishment directly from the air, however; orchids are a good example. The canopy prevents much light from reaching the forest floor, which has limited undergrowth because of low light levels. Wherever sunlight does manage to penetrate the canopy, as along the banks of streams or where trees are widely spaced, a tangled profusion of undergrowth called jungle is the result. One might logically conclude that the soils supporting such vegetation would be rich and fertile, but this is not the case. They are poor in quality and low in nutrients, the result of intense weathering in hot temperatures and extensive leaching by heavy rains. The trees remove few nutrients from these soils, though, unlike most of the crops that farmers grow. Humans are cutting down rainforests at a rapid pace; this activity is known as deforestation. Tropical forests have already almost entirely disappeared from the island of MADAGASCAR and the country of HAITI. The world’s largest rainforest, in the AMAZON Basin of South America, is shrinking fast. If the current rate of destruction continues, geographers predict that it will disappear well before the end of the 21st century. Rainforests in Africa and Southeast Asia are also endangered. Several variants of tropical rainforest exist. Tropical semi-deciduous forests are found on the margins of tropical rainforests, in places where a short dry season occurs. At this time of year, trees shed many of their leaves. Mangrove forests occur along seacoasts wherever tropical rainforests can be found. Botanists have identified several kinds of mangrove trees; all grow in salt water and have complex root systems that provide a home to many marine creatures. (See the article on GALLERY FORESTS for more information about that type of vegetation). Mediterranean scrub forest is found in areas with Mediterranean climate. This is the only climate in which most precipitation falls during the coldest months. Owing to low rainfall (normally less than 30 in or 75 cm a year), trees are widely scattered here. Bushy vegetation called maquis fills in the empty spaces between trees. Mediterranean region inhabitants have discovered that this environment is ideal for growing olive and citrus fruit trees; vineyards full of grapes are common, too. In some places within these regions, we find very large trees such as the California redwood. They seem out of place and are relics of a time long ago when the climate here was rainier. Tropical GRASSLANDS, or savannas, are associated with the alternating precipitation regime of tropical wet and dry climates. Most savannas are found adjacent to and pole ward from tropical rainforests. Here, savannas experience six months of rain and six months of drought every year, a feast or famine situation. Floods are common during the rainy season; the landscape turns brown and parched during the dry season. Some trees may grow here in wet spots, but tall grass predominates. It can be so tall that you must be on an elephant to see over it, hence the name “elephant grass.” Such grass can be sharp-edged and sawtoothed. Humans find it difficult to use savannas for much more than beef cattle ranching; the climate and poor soil quality make farming a challenge. Mid-latitude grasslands come in several varieties. They are transitional between rainy forested regions and arid desert terrains. On the rainy end of the spectrum, we find prairie grasslands. Their tall grass can reach up thigh high; bushes and wildflowers are commonly intermixed with the grass. The grass forms a thick turf; underneath we find dark brown rich soils, among the best anywhere in the world. Very little prairie grassland remains in the world today, because most has been plowed up for crop agriculture. STEPPE grasslands are found at the dry end of the continuum. The grass in these areas is usually shin high. It is generally too dry here for crop cultivation without irrigation. Soils may also be too salty for farming. Thus, people living in these areas usually choose to raise livestock such as beef cattle or sheep. Unfortunately, overgrazing may lead to accelerated soil erosion and to the invasion of undesirable plants from nearby deserts. Deserts cover a larger land area than any other category of vegetation but are widely misunderstood by persons who live in rainy landscapes. They conceive of deserts as absolutely barren sandy wastelands, devoid of any life. It is true that shifting seas of sand, called ERGs, do cover parts of some deserts, but they are more the exception than the rule. In other places, we encounter bare ground topped by scattered moving sand dunes such as the crescent-shaped dunes of Peru’s Atacama Desert. In still other places, winds have blown away dust and sand, leaving behind regs, which are pebble- and rock-covered surfaces. Dust and sand storms are frequent problems in these windy environments. Most deserts, are characterized by bushy vegetation that is called chaparral in Spanish-speaking countries. Desert plants have evolved a variety of water conservation features. Cactus plants store water in their fibrous tissue. Many plants have waxy leaves that cut down on water loss through transpiration. An example of this is the cresote bush, to which the parasitic mistletoe plant frequently attaches itself. The ocotillo bush exudes poison from its roots to prevent the growth of other plants nearby during times of water scarcity. All of these evolved features are called xerophytic adaptations. A variety of animals lives in and around these bushes. The annual rainfall in deserts is typically less than 12 in (30 cm) and undependable. When it does rain, however, it often comes in the form of cloudbursts, followed by flash floods in desert canyons. Deserts expand and contract with changes in annual rainfall. Sometimes human activities such as firewood collection or overgrazing can cause deserts to enlarge. The process of desert expansion is known as DESERTIFICATION. The world’s largest desert is the SAHARA of North Africa. Sahara is an Arabic word that means “desert.” Other important deserts include the KALAHARI and Namib of southern Africa, the Arabian of Southwest Asia, the GOBI in China, the Great Australian Desert, the Mojave desert in the southwestern part of North America and the Atacama Desert of CHILE and PERU. To these four major plant associations we must add some minor plant associations. First is TUNDRA vegetation. This is found mostly in the Northern Hemisphere in places where temperatures are too cold to permit tree growth, especially along the Arctic coastline of Canada, Alaska, Russia, and Scandinavia. The predominant kinds of vegetation are consequently bushes and grasses, plus mosses, lichens, and sedges. Since water is frozen for much of the year in the tundra, it is unavailable for plants to use, and they experience physiological drought. The surface layer of the soil melts during the warm season. A permanently frozen layer beneath the surface, known as permafrost, prevents this meltwater from seeping down through the soil. Ponds and swamps are therefore common on the tundra surface during the summer. They provide a perfect breeding place for mosquitoes and other insects. Mosquitoes plague visitors to the tundra during summer. Another minor plant association is mountain vegetation. As its name implies, it is found in the world’s biggest mountainous regions, such as the ANDES MOUNTAINS of South America. A German geographer, who used Mount Orizaba in MEXICO as his model, was first to describe this vegetation category. We therefore use the Spanish terms he employed in his description. He noted that temperatures decrease with increases in altitude in mountainous regions; therefore the kind of vegetation found at high altitudes is different than that at low altitudes. Vertical zonation of vegetation identifies this phenomenon. The sequence and contents of zones are more important than their altitude limits, which can and do vary according to the latitude of the mountain. Here is how the zones are arranged from high to low, for example, on Mount Orizaba, Mexico: zone of permanent snow and ice: normally avoided by humans; zone of alpine grasses: livestock grazing; forested zone: firewood collection; tierra fría (cold land): zone of grains such as wheat; tierra templada (temperate land): zone of coffee and corn; tierra caliente (hot land): zone of tropical crops such as sugarcane. Spotty distribution of precipitation is also characteristic of regions with mountain vegetation. The windward sides of mountains are typically well watered, while the lee sides, in the rain shadow of the mountains, may exhibit arid conditions. Finally, some parts of the Earth are devoid of any vegetation. Most important of these is the continent of ANTARCTICA, which is almost entirely covered by a permanent layer of snow and ice.